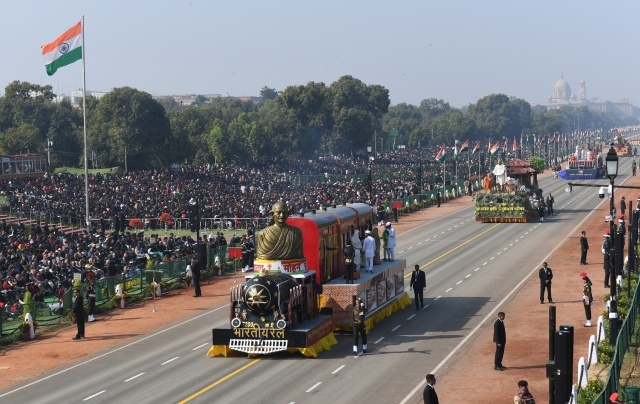 (AFP) - Thousands watched as tanks, camel-mounted forces and motorbike stunt riders paraded in New Delhi Saturday, as India marked its seventieth Republic Day in an annual display of culture and military might. Security was tight, especially in the capital where large sections were sealed off for the parade and visiting dignitaries including South African President Cyril Ramaphosa, who was the guest of honour. Around 25,000 police and paramilitary forces were deployed across the city for the event. The day marks the date in 1950 when India's new constitution came into effect. India gained independence from Britain in 1947, but went through a transitional phase when it was still classed as a dominion. On the eve of the national day, Indian President Ram Nath Kovind urged people to vote in national elections due by May. "An election is not just a political exercise. An election is a collective call to wisdom and a collective call to action," Kovind said in his speech. "This makes the very act of voting a sacred act," he added. Prime Minister Narendra Modi, who analysts say is locked in a hard-fought electoral battle, hopes to be re-elected in the upcoming elections. Ramaphosa, who is leading a delegation to India, held a meeting with Modi and said he hoped for closer bilateral cooperation between the two countries. "(We) concluded this morning a three year strategic programme of cooperation," Ramaphosa told journalists after the Friday meeting.